Everyone loves fried chicken, I am sure. What more when it’s fried chicken with a difference. 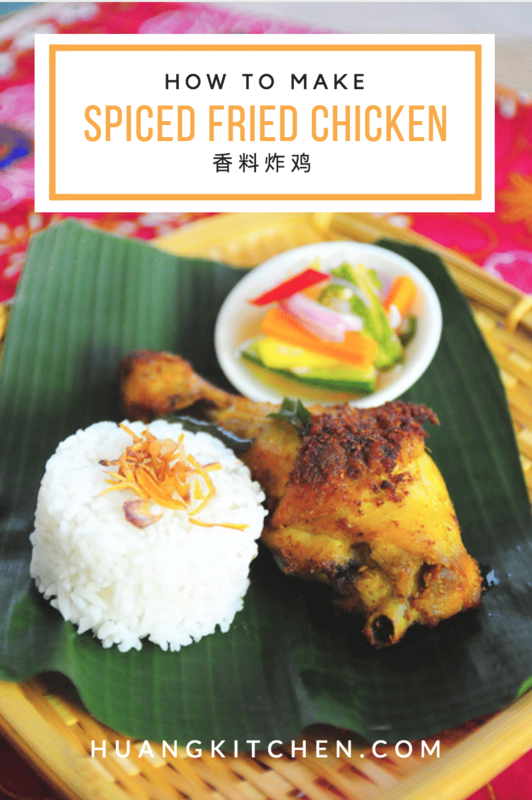 This recipe for Spiced Fried Chicken is a classic Indonesian fried chicken dish. 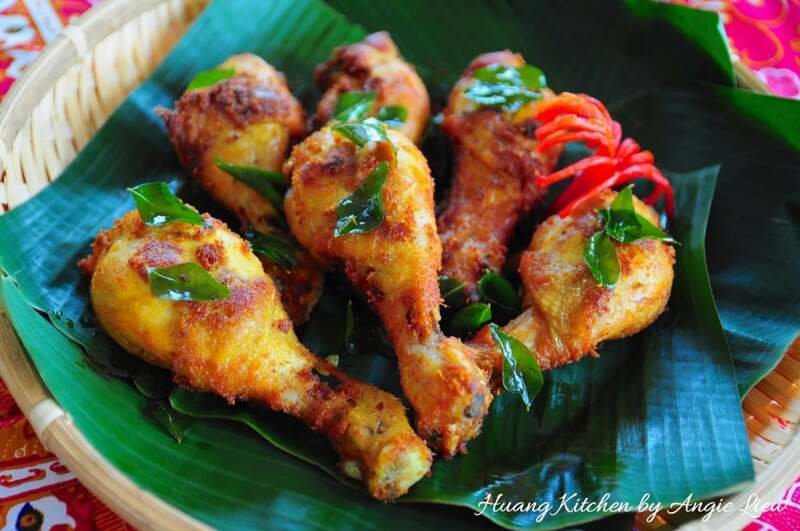 The secret to these incredibly flavourful and juicy fried chicken: First, simmer the drumsticks in this amazing marinade of fresh herbs and spices to seal in the aroma, then deep fry to crispy golden brown perfection! 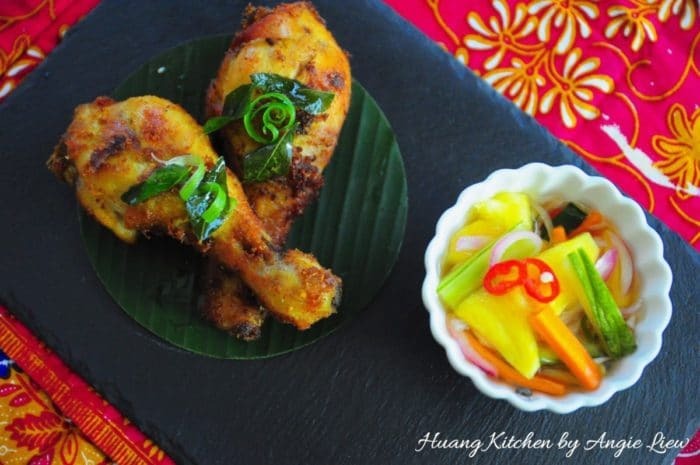 Voila, you have fried chicken that’s extremely juicy, flavourful and wonderfully aromatic. 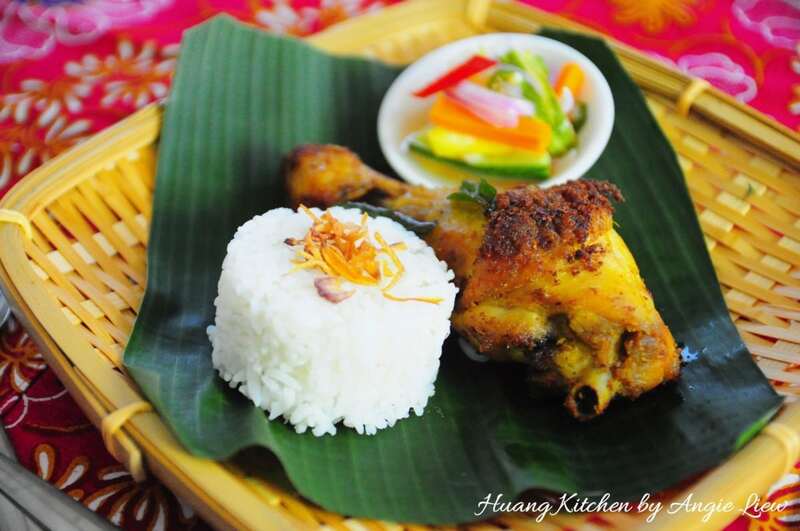 Fried chicken done this way is generally served with rice and a pickled vegetable dish, like the Cucumber Pineapple Pickle in the previous recipe. Every bite is packed with an aromatic and flavourful kick. You will never have enough as it’s so mouth watering and finger licking yummy good! 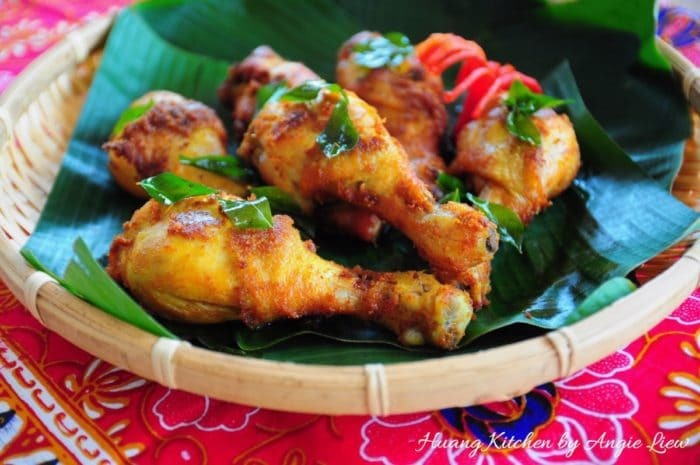 The secret to these incredibly flavourful, juicy and crispy Spiced Fried Chicken... First simmer them in this amazing blend of spices to seal in the aroma, then deep fry to perfection! Best enjoyed with our Cucumber and Pineapple Pickle! 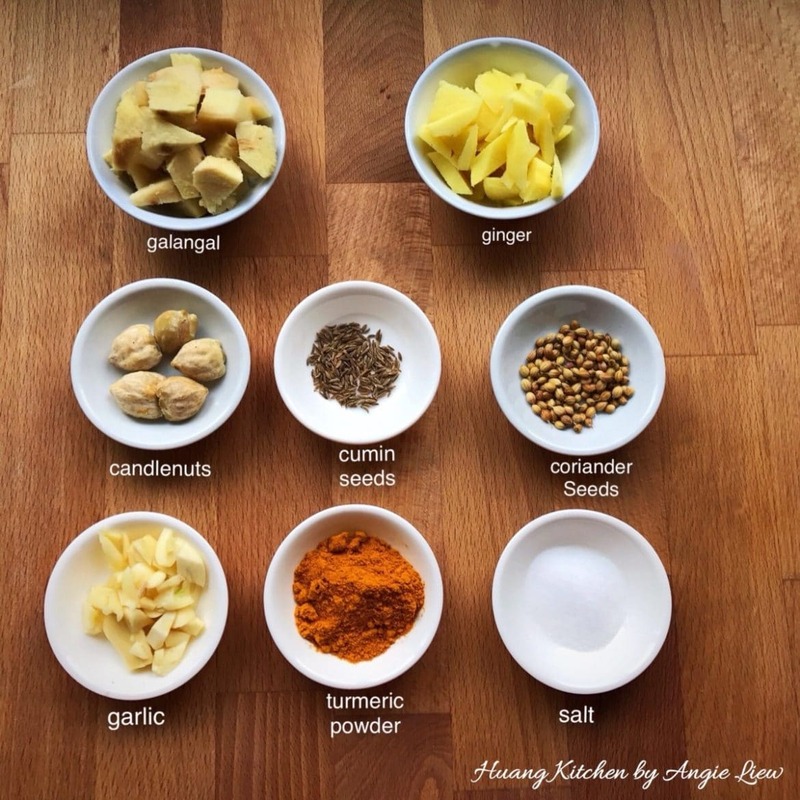 Start by preparing and cutting all ingredients needed to make the spice paste. 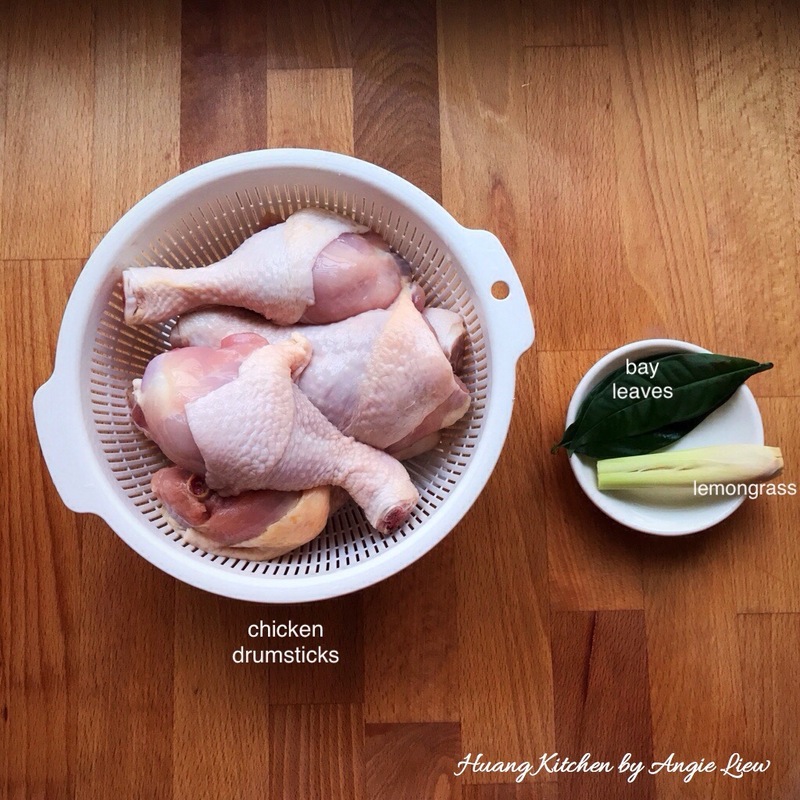 Clean and drained well chicken drumsticks or chicken pieces cut into serving portions. Also rinse well bay leaves and bruised a lemongrass. And we're ready to make the spice paste. To make the paste, first stir fry candlenuts, coriander and cumin seeds in a skillet over low heat till fragrant. 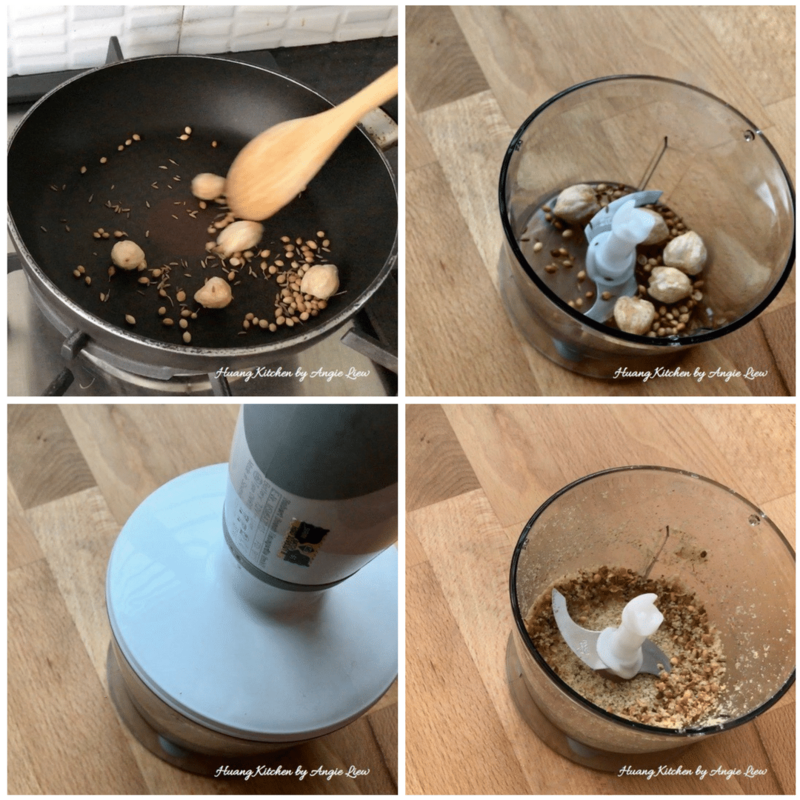 Then grind them in a blender till fine. 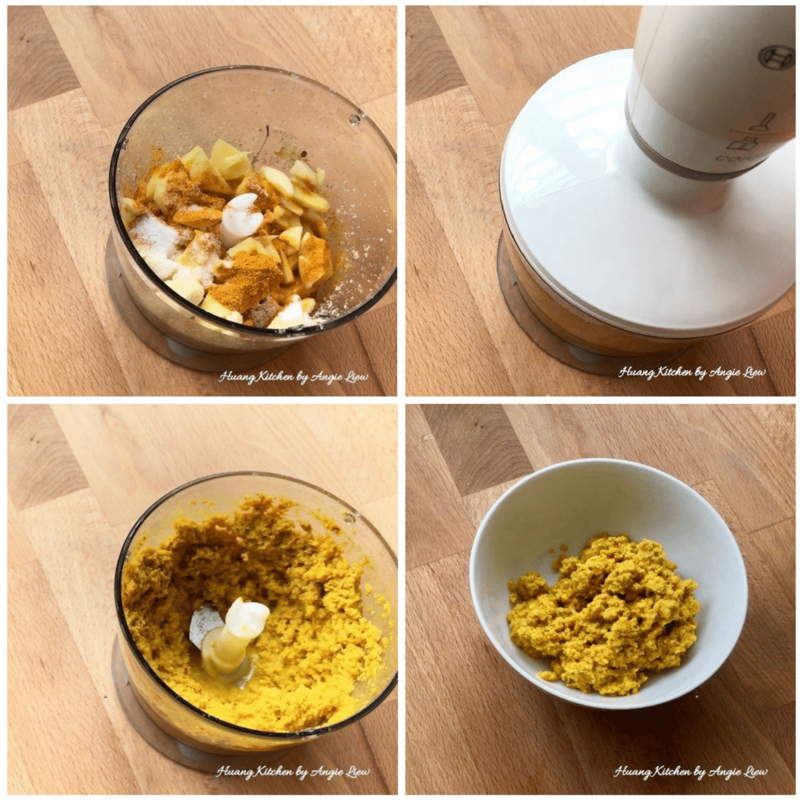 Next, add in galangal, ginger, turmeric powder, garlic, salt and water and grind to form a smooth paste. Heat up oil and stir fry the spice paste till fragrant. Add the chicken pieces and continue to stir fry over medium heat to coat the chicken with the spice paste. Add in sugar and ground white pepper. Then toss in lemongrass and bay leaves. Cover the wok and simmer over low heat for 30 minutes. While simmering, be sure to turn the spice coated chicken pieces from time to time until all the moisture is absorbed and the chicken meat turns tender. When done, discard bay leaves and bruised lemongrass and remove the chicken pieces from the wok. And we're ready to fry the chicken pieces! Heat enough oil in a wok until very hot. 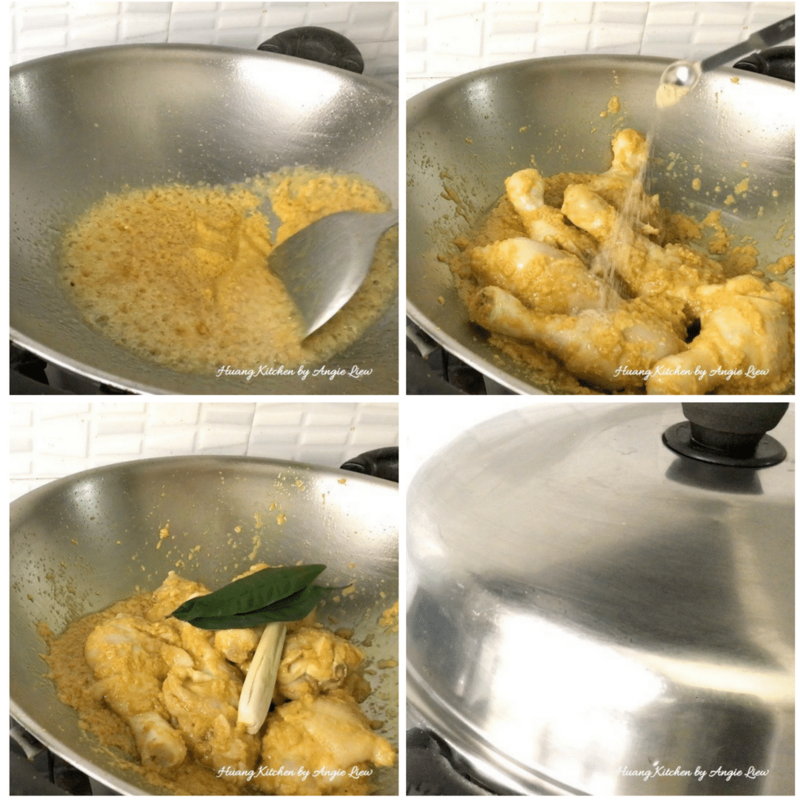 Add in curry leaves to infuse the oil with aromatic curry leaves flavour. Then discard the curry leaves. In batches, add the spice coated chicken pieces and deep fry over high heat until golden brown, about 3 minutes. Drain well and we're done! Serve hot with pickle vegetables and rice. Enjoy! The chicken can be prepared the day before. Only simmer the chicken pieces with the spice paste, then keep refrigerated overnight before frying. Stir frying the spices before blending enhances the fragrance of the spices. 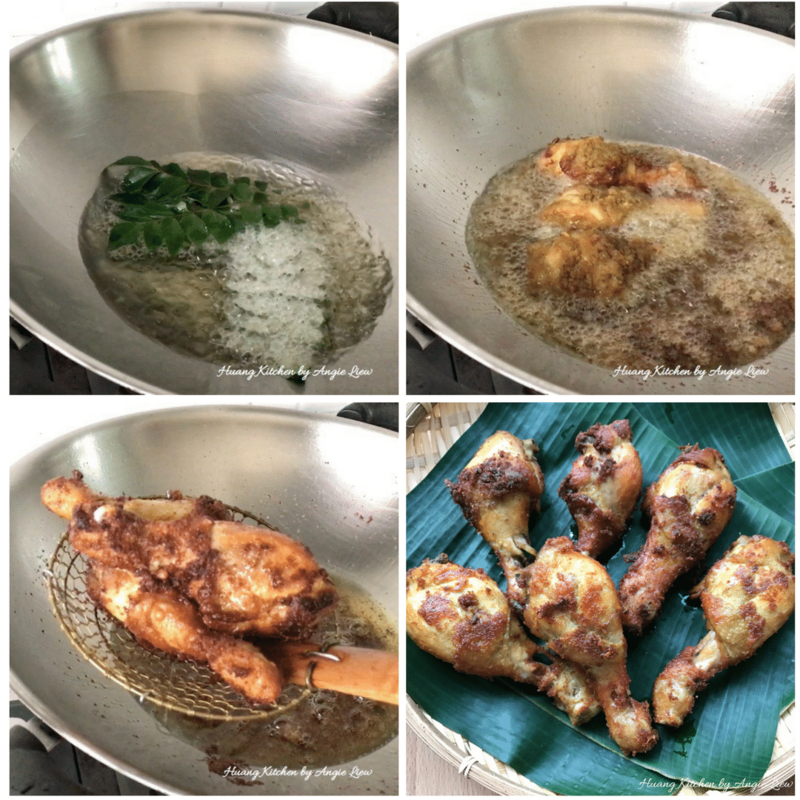 This method of simmering the chicken pieces with spices before deep frying ensures that the chicken pieces are evenly and thoroughly cooked. It only cuts down the frying time. 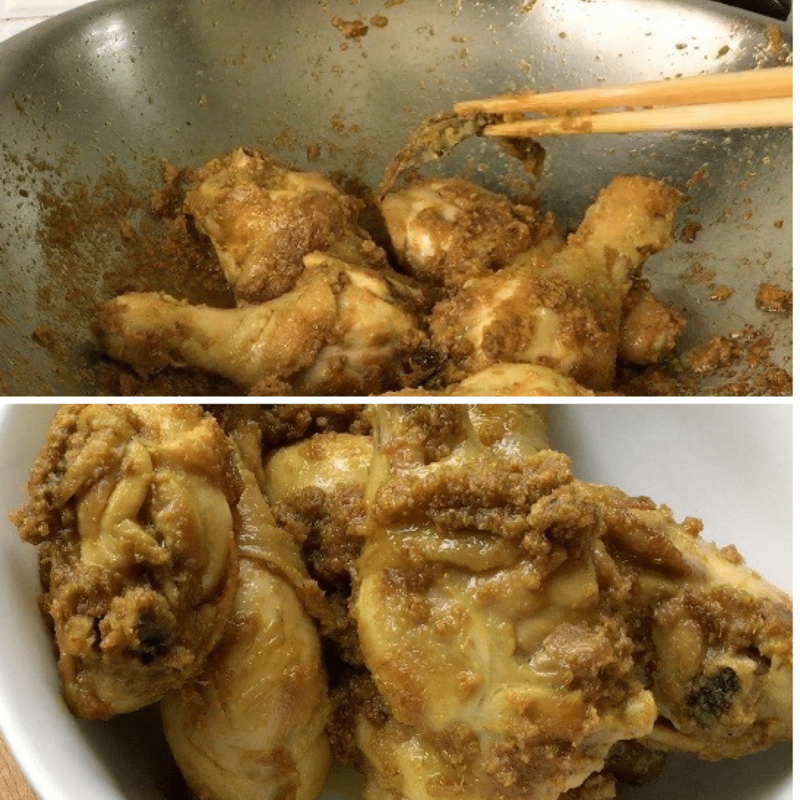 Cut the chicken into a smaller serving portions to ensure that the spice mixture is well absorbed, so the chicken will be crunchy on the outside.